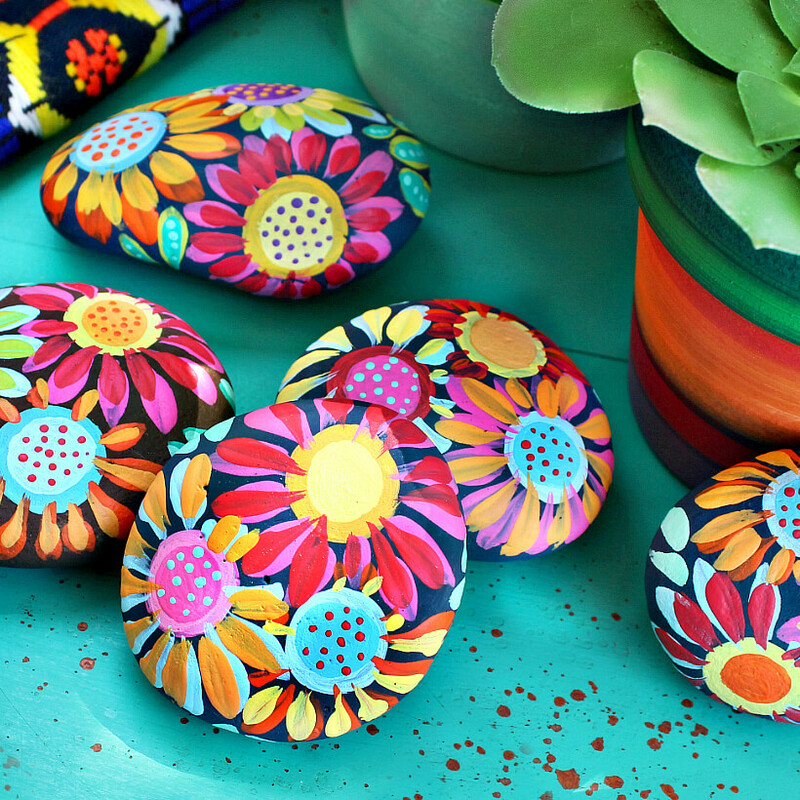 Whether you create your own or purchase them, painted rocks are fun and can lift your spirits when you see them. They can decorate your shelves, window sills, and desk at home or at work. Ranging from small to large, the possible designs for decorating rocks are unlimited, so they can fit in with any decor. They can be inexpensive decorative items that create an unexpected addition to an area. You just need to think beyond something you sit somewhere and notice from time to time. 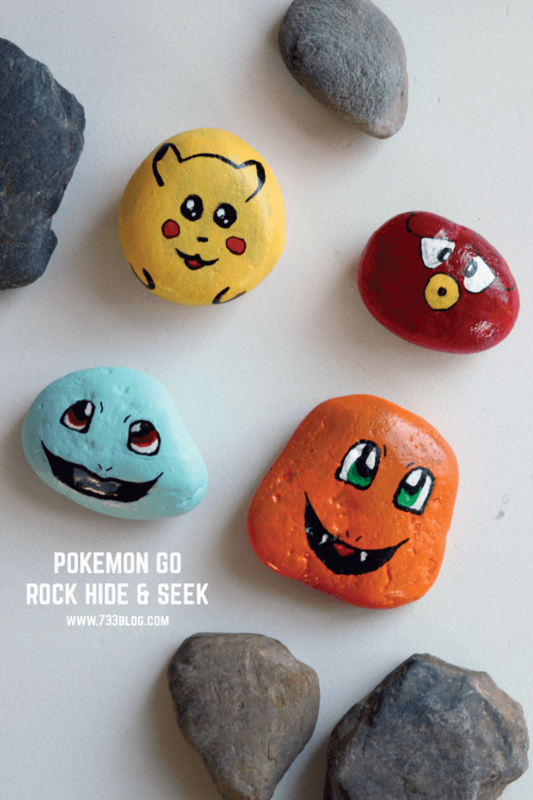 Among this collection of ideas for decorated rocks, we highlight some rocks used as playing pieces for games. They can also be added to planters, terrariums, and outdoor gardens. Use them as knobs by gluing them on the tops of lids, fronts of drawers, and cupboard doors. Glue them on jewelry fixings and create your own pendants or other jewelry. Consider using them as part of your table decor. Scatter rocks painted to feature forest creatures among bare branches and autumn leaves on the center of your table for a unique fall table display. Look at the various painted rocks presented here and think of the ways you could use them or think of other designs that you can create and use. 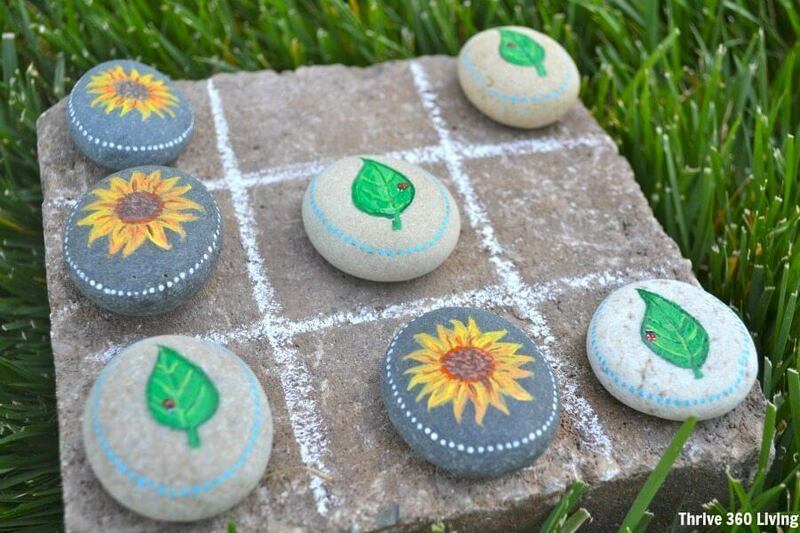 This tic-tac-toe game uses two sets of rocks as playing pieces. You can use this idea to create rocks to play checkers, chess, or other games. You can create a special rock for each family member to use to play a variety of board games. Make playing games even more fun with special playing pieces. 2. Who Has Unique Book Ends? Of course decorated rocks can be used as paperweights, but that is not the only functional use for them. 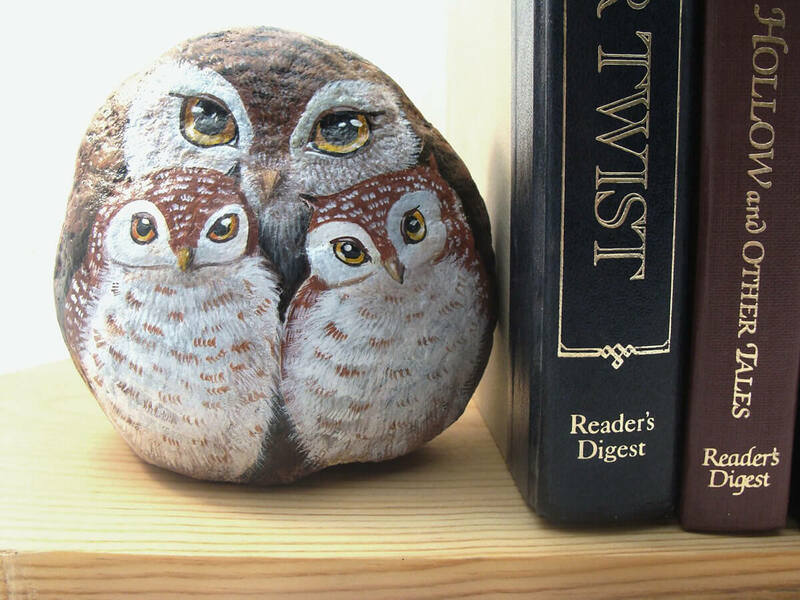 Just like this rock featuring a family of owls, large, heavyweight rocks can be used as bookends. They can add a unique decorative flair to your bookcases and your room. Express your inner self with your rock collection. 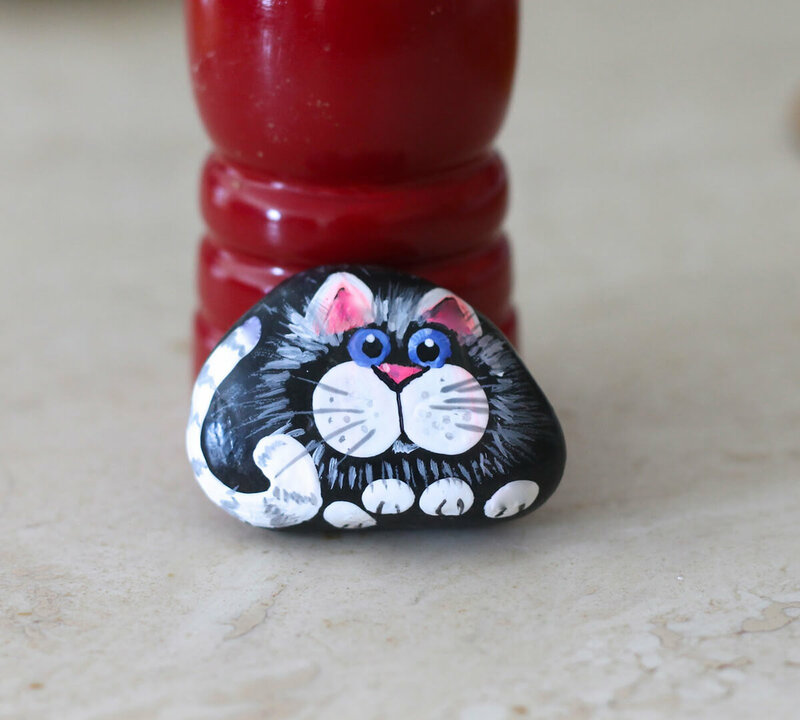 If you have an attachment to cats, gnomes, or something else, let your rock collection show it. 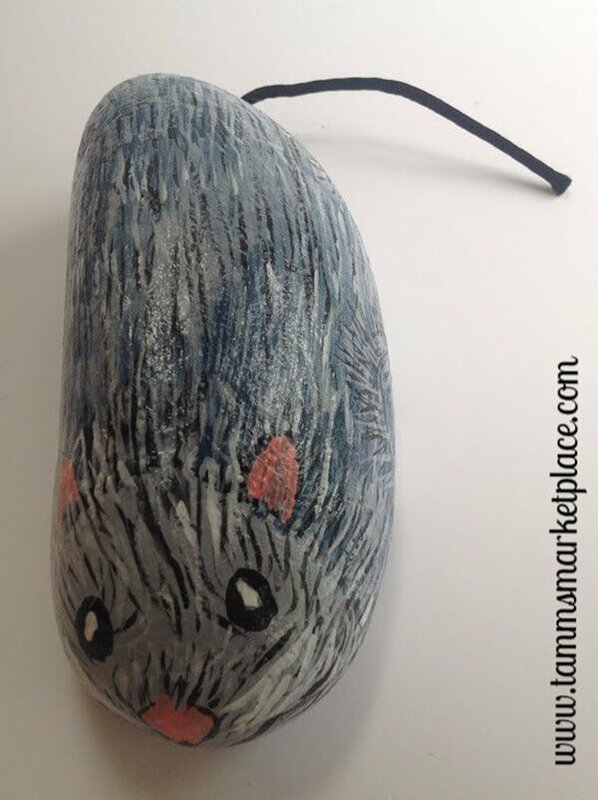 You can create or purchase rocks of all sizes and shapes that feature your passion and place them around your home to surround you and bring you joy. 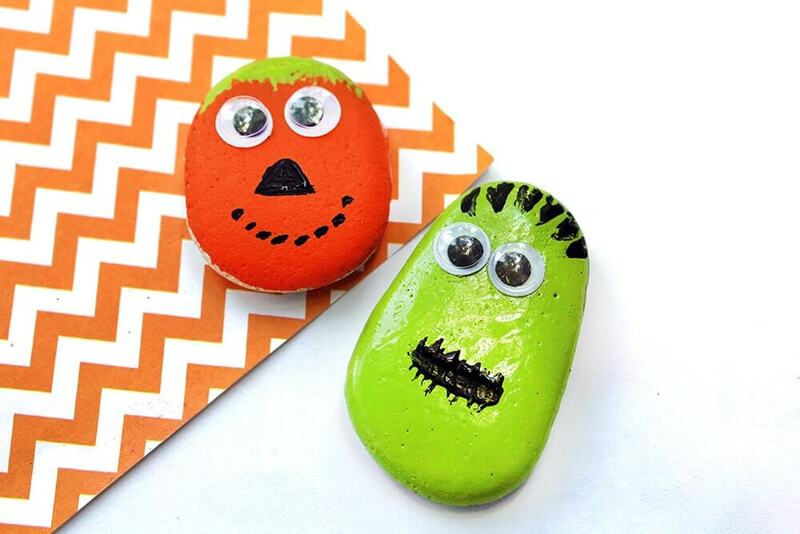 Let your children create their own rock characters and use them in one of the ways already discussed or glue them on magnets. They will be great refrigerator magnets to hold your child’s artwork, and the magnets themselves will be part of the display featuring more of your child’s artistic endeavors to be saved for the future. This is a really different idea for using decorated rocks. 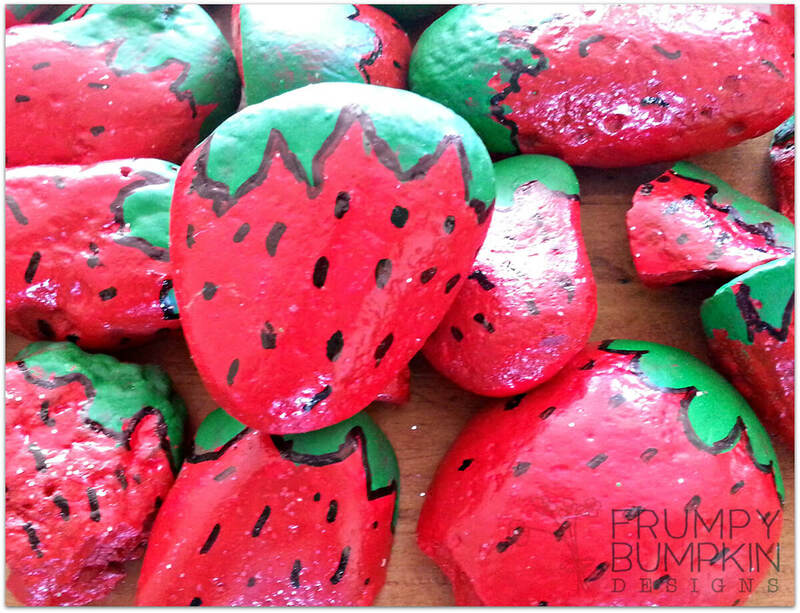 The rocks are made to look like strawberries so that you can place them in your strawberry beds when your berries are ready to ripen. The birds will be attracted to the rocks, but they will find them inedible. So, when your real berries ripen, the birds will leave them alone. 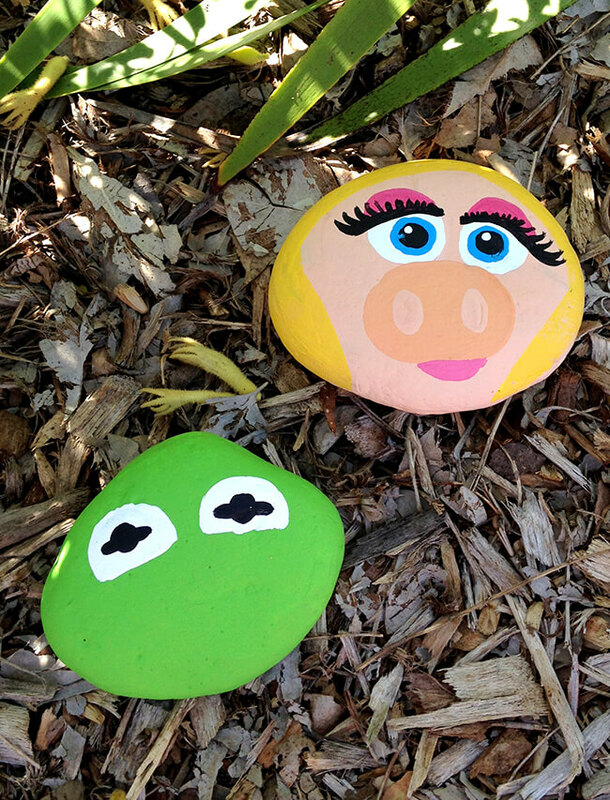 This is another decorated rock project for your kids. A small version can be displayed on your child’s bookcase as a bookworm. Versions with larger rocks can decorate your garden, and maybe even result in your kids participating in the garden even more. 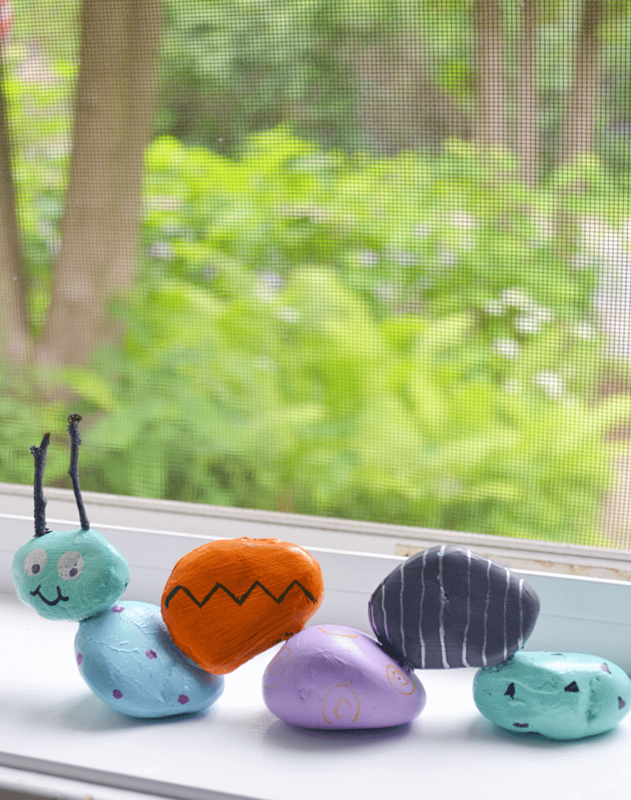 It is so easy and inexpensive that each child can make their own bookworm or caterpillar. Rock painting is a great activity for a your child’s next party, even a slumber party for teenage girls. As we have already mentioned, it is inexpensive, loads of fun, and provides each child with something to take home. 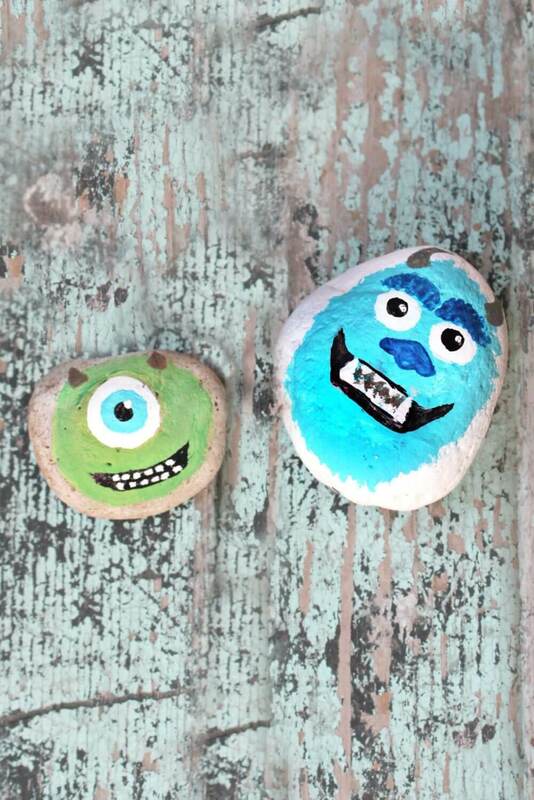 The children can decorate their rocks based on a theme, or they can create anything they want. 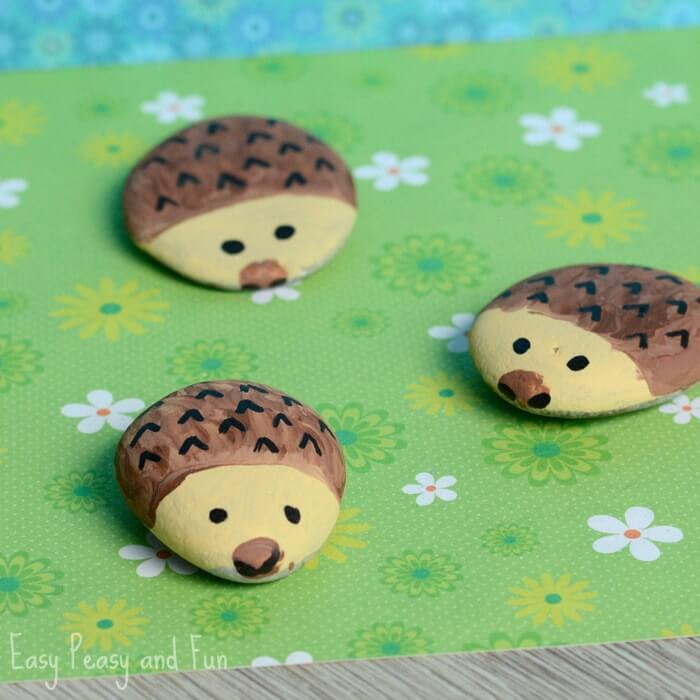 These hedgehogs can be the start of a wildlife rock collection. You can create turtles, lady bugs, and other wildlife. Then, you can place small ones in planters and terrariums. Larger ones can be used in the garden. These wildlife rocks are also perfect to scatter around branches and leaves for tabletop decor as mentioned previously. Your designs do not have to be realistic representations. You can create geometric designs, color blocks, or just spatter paint them. Rock designs like these can be fit into the kitchen, kids rooms, or modern art decor. Consider using them in many of the ways we have already suggested including as knob tops and pulls. 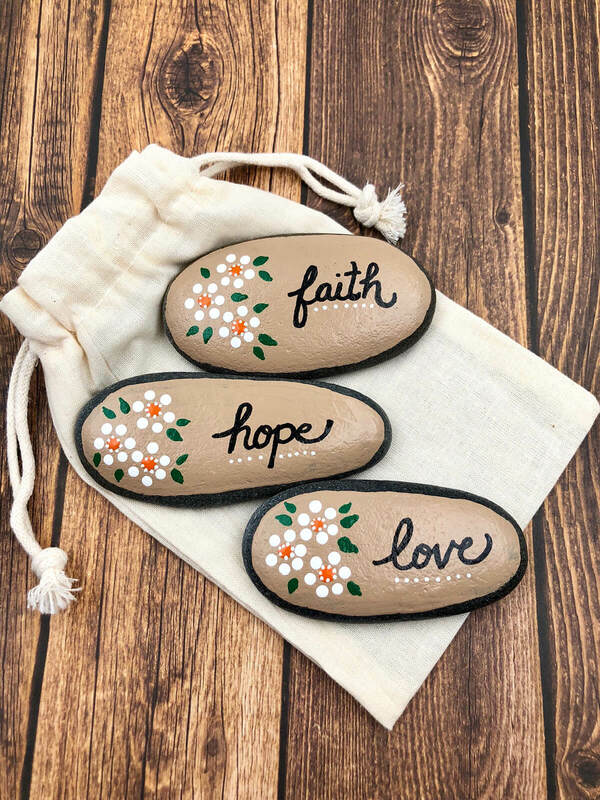 Decorate your rocks with simple designs and encouraging, inspirational words. You can give them to friends, sit them around your house, leave them in public places, or put them in planters, terrariums, and your garden. You can also attach several of them to a board and create wall art for your home. You don’t need a green thumb, but you could end up with a thumb with green paint on it. Cacti are popular plants that don’t need to be watered as often as other plants. However, some people see even cacti as beyond their horticultural abilities. 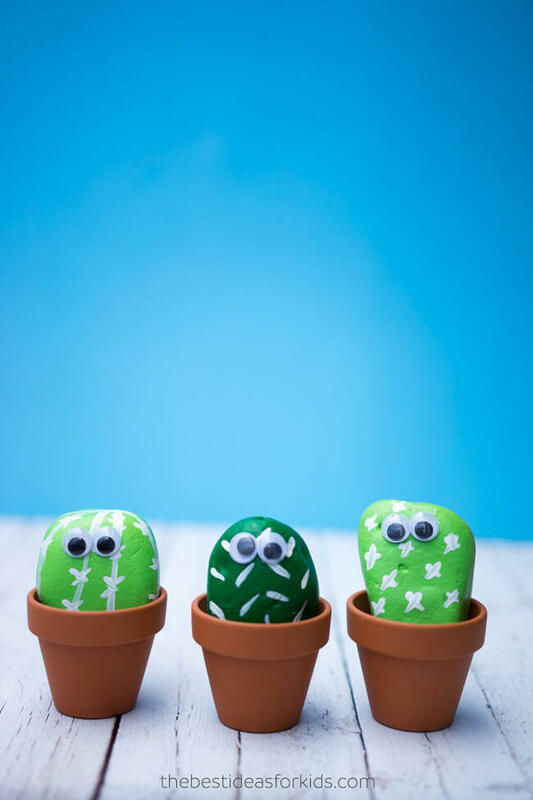 If you are among those people, create your own variety of rock cacti. Paint some rocks for people you don’t even know. 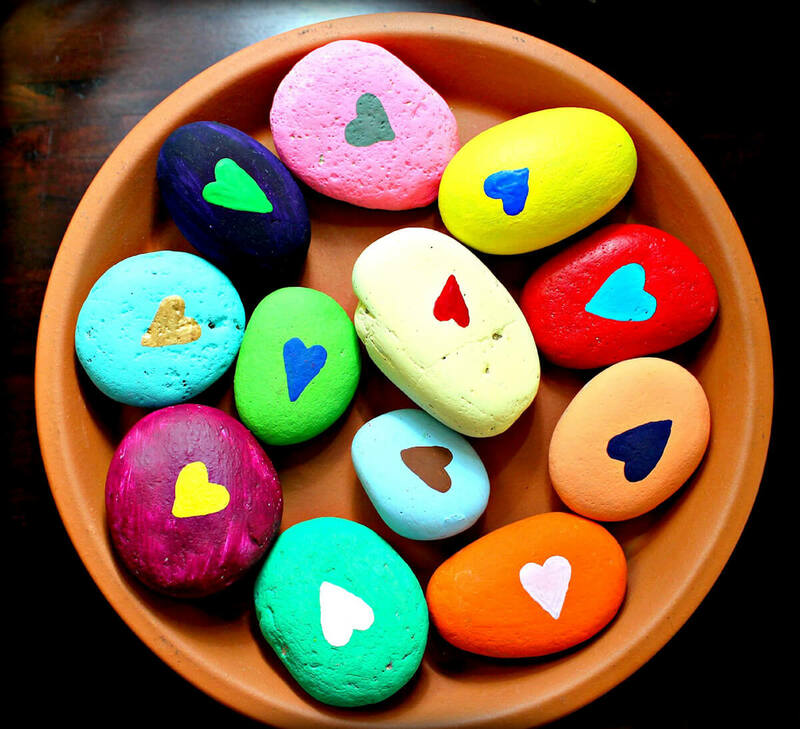 Making colorful rocks with hearts on them is quick and easy. You can even use a stencil and add “For the finder” on the back. Now, leave them in places where people will find them and imagine the smiles they will bring to people’s faces. Your rock faces may not be on par with the famous faces on Mount Rushmore, but they can create smiles for viewers and recipients. Your rock faces could actually be caricatures of guests at your next dinner party. Just use the rock caricatures as place cards and let your guests help each other find their seats. Anyone can use stencils and simple painting techniques to create designs that look intricate. These beautiful flowers are just circles and brush strokes. If you look carefully, you will see that there was not an attempt to paint with machine perfection. Yet these rocks are beautiful enough to use as knobs on lids, drawers, and cupboard doors. Just have fun with your kids, grandkids, or on your own. 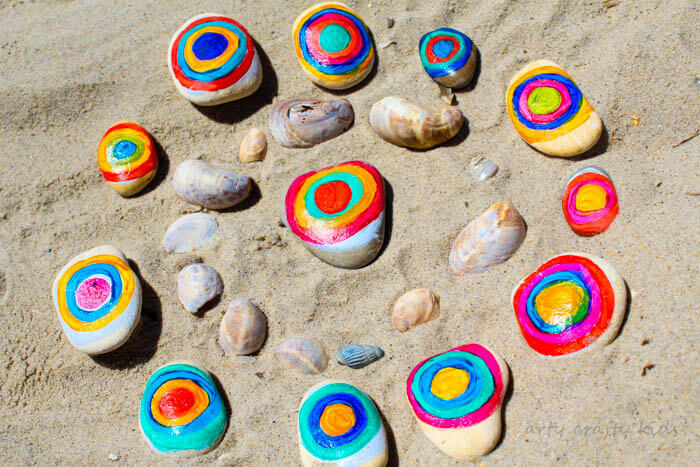 These are rocks not canvases. Even painted designs that resemble caveman drawings have a certain precedent-setting style. As we stated these are rocks. Painted doodles are just as interesting as other designs. So don’t worry about not being able to draw a straight line. It’s not required. For fun, you should try to create your own rocks, but if you don’t think that you can create designs, there are a lot available for sale, so you still can have painted rocks to use in all the ways we have mentioned. Start by also placing this mouse in the kitchen or on a cheese cutting board as a knife rest. 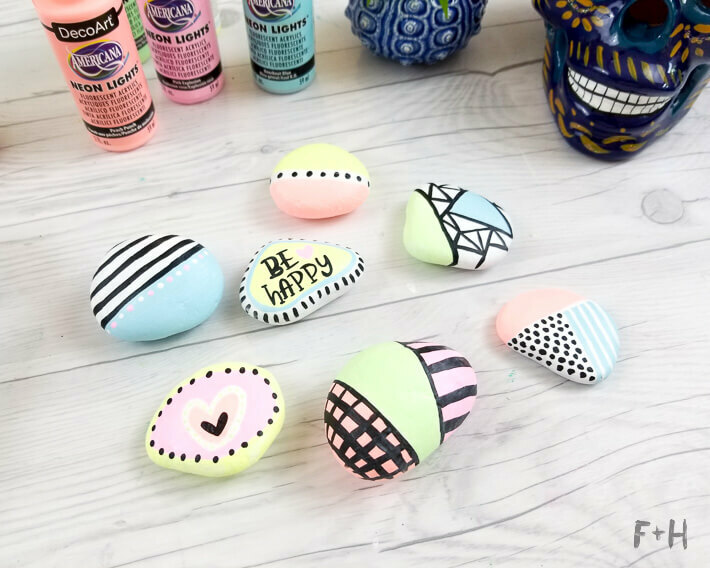 Decorating rocks is an activity that encourages kids to paint and draw before they convince themselves that they can’t. Painting and drawing are skills that improve with practice. Everybody is not going to be Van Gogh, but most children will enjoy painting rocks. Encouraging them to paint designs on rocks exposes them to the enjoyment of creating and think creatively. 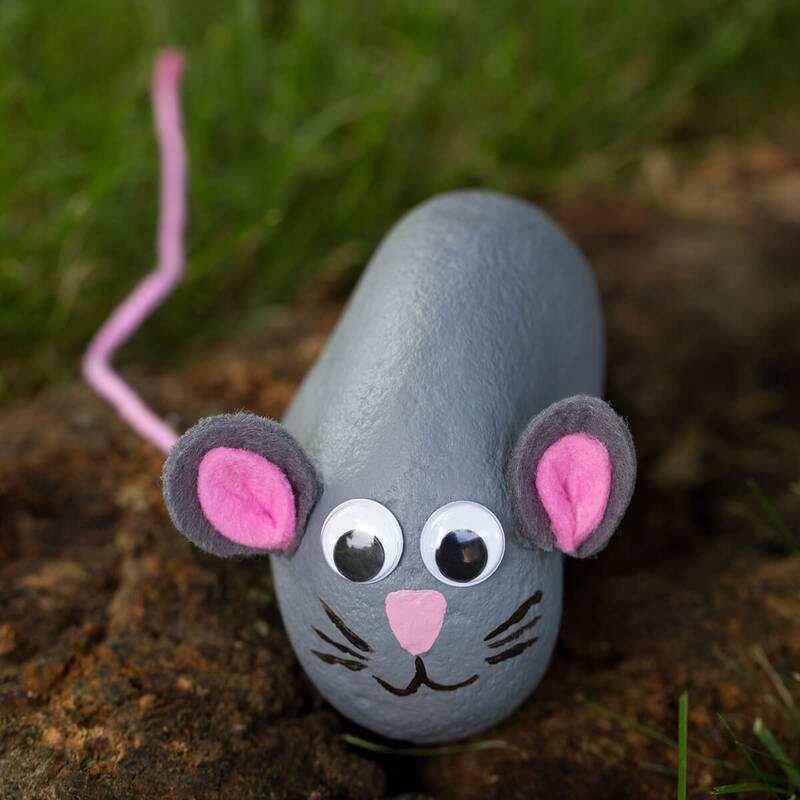 This adorable rock mouse shows that you don’t have to create an intricate design to decorate rocks. This mouse is simpler than the earlier mouse, and it has a different personality. If this mouse appeals to you, consider creating similar creatures such as a black cat, a hippo, and a pig. 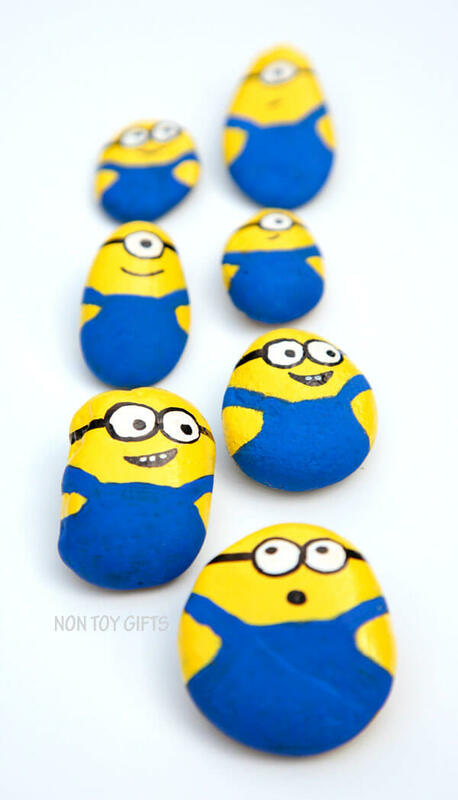 Decorate rocks for any holiday. These monsters are great for Halloween, but kids will love them year round. Ideas for other holidays include hearts with messages for Valentine’s Day; Easter egg rocks; flowers, messages, and best mom awards for Mother’s Day; best dad awards and golf ball markers for Father’s Day; patriotic designs for the Fourth of July; and then, fall and winter holiday designs. 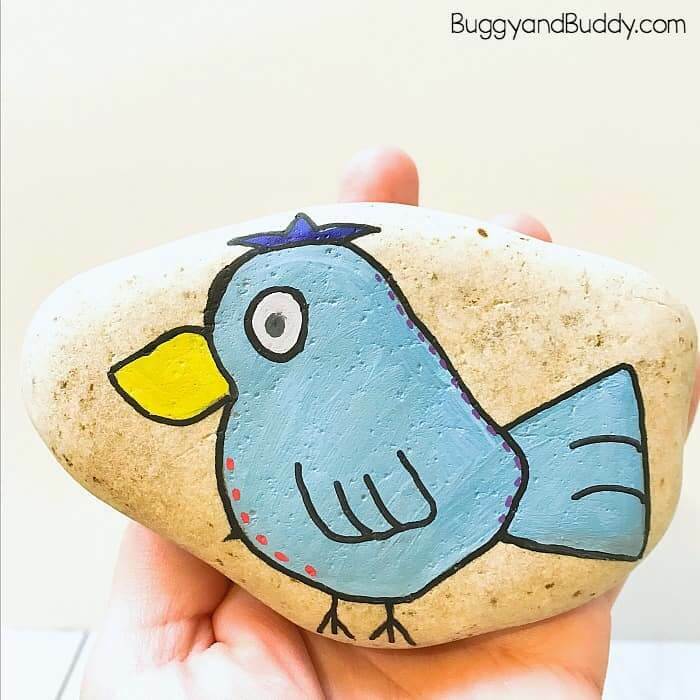 Just keep a supply of rocks and paint handy so that you and your kids can create designs and ways to use the rocks whenever inspiration strikes. These rocks do not feature complicated designs. Yet, the designs catch the eye and create a cheerful vibe. Part of the cheerfulness comes from the bright pastel colors. The other part of their cheerfulness comes from their basic mixed patterns. The rocks have sections with solid colors or different patterns such as dots, stripes, triangles or checked. They can be used on the table with confetti, as Easter eggs, or in planters and in the garden.